“Fitness Centre.” I rarely bring my gym stuff to squeak in a little exercise by the end of the day. Fancy hotels will have some semblance of a fitness centre, but when the photo online shows three machines (actually two machines and a bench), don’t expect much. I was dumb enough to bring my gym stuff this time. Sure enough, the “gym” was in the garage, had a broken elliptical machine, broken bike, a bench (at least that wasn’t broken), and four weights that were lighter than my damn laptop. The wall-length mirror didn’t make the room seem bigger; my reflection made me look even more foolish standing among the busted crap in my running shoes. “Internet access in all rooms.” Basically means I get a very weak internet signal only if I stand next to my room door and point my damn iPod towards the peephole. “Satellite TV” means I can choose between a Jean-Claude van Damme movie festival or the Twilight saga. “A buffet to get your day started” means soggy and cold scrambled eggs, Nescafe, rotten fruit, orange juice – I mean orange drink, sorry, and tablecloths that look like more than a few people suffered coughing fits and left battle scars in the process. And marmalade is the only thing to put on my dry bread. I HATE marmalade. 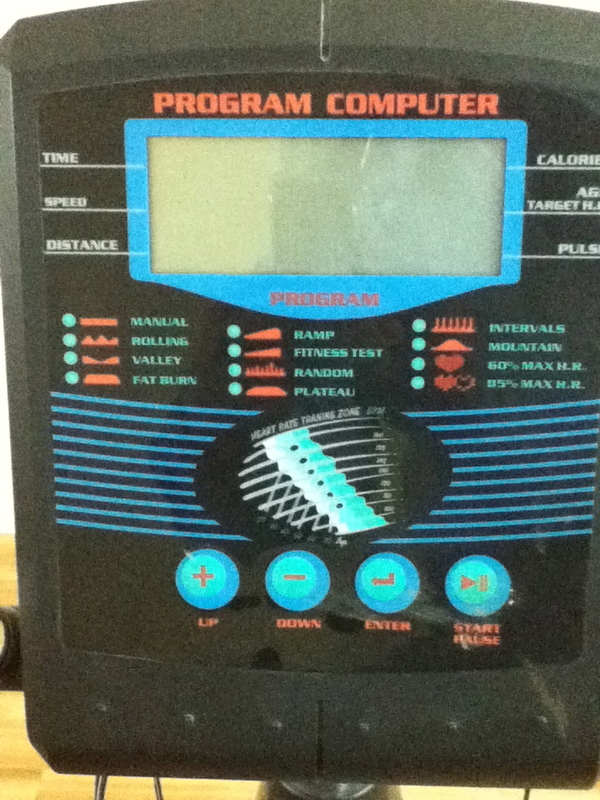 The bike machine interface. Reminds me of a video game I got for Christmas. In 1982. “All the comforts of home.” Sorry, but I have TWO PLY toilet paper back in mi casa. And when I ask for a towel after traveling for 24 hours straight, I don’t want to wait over an hour and have it be damp and smell like cigarettes when I finally get it. Don’t get me wrong, I’m not unhappy. I have spent many years managing my expectations, or at the very least reducing them to a minimum. After all, when will I ever find the time to sit down, relax and watch a van Damme movie? The last time was on a bus in Tanzania, and that movie was dubbed in Chinese. His grunts sound much better in English. This is awesome.